Orthodontics is a branch of dentistry specializing in the diagnosis, prevention, and treatment of jaw, face, and bite irregularities. All that is good begins with a SMILE.When you visit our office, your smile is our top priority. Our entire team is dedicated to providing you with the personalized, gentle care that you deserve. 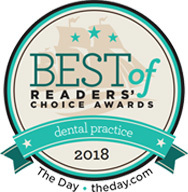 We have been voted best dental office by "The Day Reader Choice Awards" for four straight years. Prevention includes regular dental exams, cleanings, and x-rays. Sealants and fluoride are also great preventive treatments. We are able to improve the look of teeth and smiles with quick, painless and surprisingly affordable treatments. We will always discuss with you the available restorative options and recommend the most comfortable and least invasive treatment. Whether it's braces or clear aligners, we can help you have the straight, beautiful smile you've been waiting for! I have been a patient at Waterford Dental Health for 20 years and never once have I been disappointed with the care I have been given. I see Laura for my cleanings and Dr. Patterson for any dental work I need. I have had everything but implants and have walked out of the practice pain free. It is a very compassionate practice with a friendly atmosphere no matter who you speak with. I would highly recommend Waterford Dental Health without any hesitation. Thank you to the practice and Dr. Patterson for your kind and compassionate care all of these years. I have seen a lot of the hygienist and doctors here and they are all great. Very knowledgeable and friendly staff. I love that they send reminder/confirmation text. I have recommended Waterford Dental Health to many of my friends in CT. If you're looking for great dentist, they will not disappoint! I have been a patient of WDH for many, many years and always feel they have my best interest in the procedures they recommend and perform. I recently opted to move ahead with Invisaligns to correct bite issues and Dr. Campbell was very understanding of my concerns and working around my schedule. ( I am also pleased with the progress in only 6 months.) The office staff is also very helpful and friendly. I also love my hygienist Lynn!. She always remembers and works around my jaw issues!